We produce powerful, imaginative and considered projects that encourage artists and their practice to engage with the landscape. Our projects include immersive short and long-term residencies and outdoor exhibitions in an ever growing number of rural locations throughout Ireland. We support emerging artists whose practices focus on the landscape, and where themes of environment, community, heritage and collaboration are intrinsic to, and reflected in their work. LOTL was founded and continues to be creatively produced by Kari Cahill and Hazel Mc Cague. ARTISTICALLY OUR AIM IS TO DRIVE ARTISTS AND THE EXPERIENCE OF ART OUTWARDS INTO THE WILD LANDSCAPE OF THIS ISLAND. We believe that exploring the interconnection of art, nature and people can be transformative. Our projects create greater accessibility to the arts in rural communities while allowing the visual arts to stand alone as a valuable and necessary cultural activity and experience. Res 1-3 are a series of three short-term residencies that will take place in the beautiful wilderness of Lauragh, Co Kerry in March and Port, Donegal in July. Follow the link for more information and to find out how to apply. Tombolo is a site responsive outdoor art residency that will culminate in an expansive public exhibition. It will take place this coming May on Brow Head, Mizen Peninsula, West Cork. Follow the link to find out more about the project and for information about the open call for submissions. The workshop series Is a community engagement programme that will run in conjunction with Tombolo 2019. During the exhibition weekend artists will lead a series of creatively engaging workshops open to children and adults. 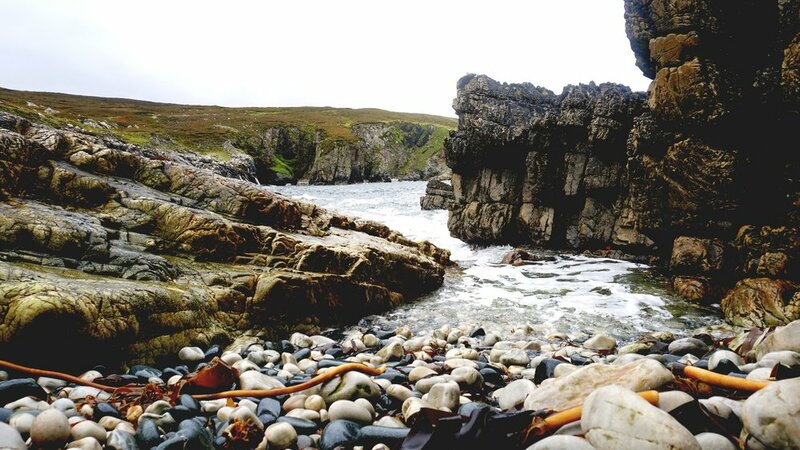 The wild coast of Donegal is the backdrop for Calafort. Using a similar approach to TOMBOLO, the project will be an opportunity for another community to engage with visual art within the context of landscape. We are always looking to collaborate and work with artists, crew and volunteers. If you like the sound of what we do, love the outdoors and the opportunity to have loads of craic follow the links below to find out how to get involved in our upcoming projects. To become a participating artist in our 2019 projects RES 1-3 & TOMBOLO follow the link to find out how to apply. If you would like to get involved as a volunteer please follow the link to see more details. Since its inception in 2016, Lay of the Land have created three large scale site-responsive projects. They have all taken the form of a two-week artist’s residency followed by a public outdoor exhibition. The project artists work in a scale and manner dictated by the magnitude of their surroundings, creating powerful and informed art works in response to time immersed in the landscape. Site-responsive residency and exhibition at Knockomagh Wood Nature Reserve, Lough Hyne, West Cork. 4 artists. 4 weeks. 13 works of art. 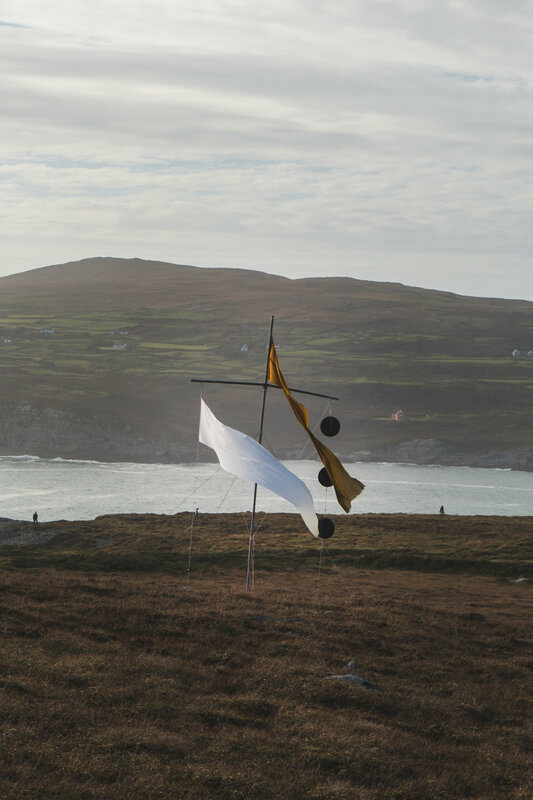 Site-responsive residency and exhibition on Brow Head, Mizen Peninsula, West Cork. 8 artists. 4 weeks. 17 works of art. 6 artists. 3 weeks. 13 works of art. To date our projects have been part-funded by the Arts Council of Ireland, Cork County Council, a Fundit campaign, donations through our website and donations over the Tombolo and Silva exhibition weekends. We are eternally grateful to the many people who have generously given their time, energy and resources to our projects. The project of connecting landscape and art could never happen without their continued support. A special thanks to the Art Council of Ireland for granting us the Arts Grant Award 2018. This funding enables us to develop new projects, support artists and present unique and innovative outdoor exhibitions. Producing and exhibiting art in the wild presents many logistical as well as elemental challenges. We continue to rely on the generosity of supporters of the arts to part-fund our projects. If you are able to donate please follow the link below. One of our core principles is transparency in terms of where resources come from and where they go. We have created these graphs to illustrate income and expenditure for each project. If you like what we do and want to support our projects please follow the link below.